The mysterious submarine found inside Swedish waters this week (27.07) has turned out to be the Imperial Russian submarine Som, lead ship of its class. The vessel sank in a collision with the Swedish steamer Ångermanland (also reported incorrectly as being named Ingermanland). In a bizarre twist of fate, Ångermanland was coming from the port of Mäntyluoto, Pori, in what was at the time the Russian Grand Duchy of Finland, carrying packages for Russian POW’s held in Germany. The Som was originally laid down as the Fulton by the legendary Electric Boat Company, and served as the prototype for one of the US Navy’s first submarine classes, the Plunger-class, . The details of the sinking have been known [1, 2, 3], but the exact location of the wreck has so far not been determined. The submarine looked “modern”, but could be from the 80’s, it was found roughly 1.5 nautical miles (2.75 km) from the coast, clearly inside Swedish waters, and the hatches were closed. No to very little damage was visible externally. The vessel was roughly 20 meters in length, and around 3 meters wide. And there were what looked like Cyrillic signs on the wreck. Added to this, a small amount of video clips were released, without any comments regarding which part of the hull was in picture at any given moment. A single multibeam sonar picture of the wreck in its entirety was also released. All in all, the original picture given was that the submarine was a midget submarine, dating from the time of the great Swedish subhunts, or newer. This, coupled with the Cyrillic lettering, made the wreck politically sensitive. However, things soon started to fall apart for Ocean X Team. Submarine designs have varied greatly over the 100+ years they have been in active service. The early submarines had usually a somewhat cigar-shaped hull, with the conning towers being either completly absent or very low (the terms ‘sail’ and ‘conning tower’ are often used interchangeably in English, although this is technically incorrect). The leading designer of this time was John P. Holland of the abovementioned Electric Boat Company, which either directly through exported designs or indirectly by influencing other designers set the pattern for these early vessels. 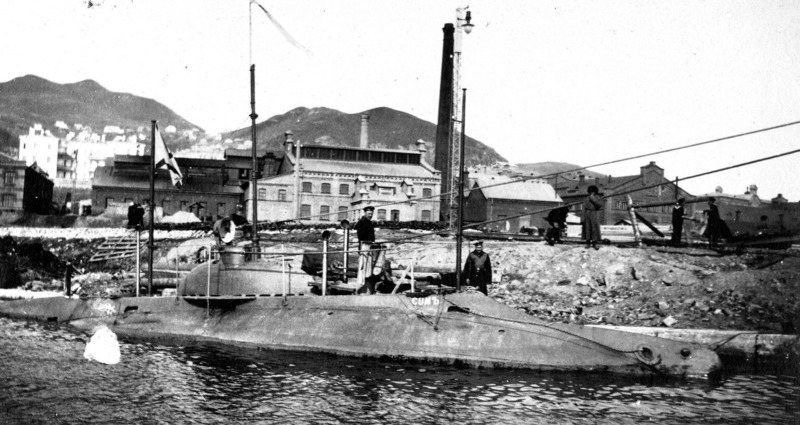 Som is an example of the former, with Hajen, Sweden’s first submarine, is an example of the latter. Hajen was designed and built in Sweden, but clearly patterned after Holland’s designs. It currently resides as a museum ship in Marinmuseum in Karlskrona. In the years leading up to and during the WWI, the hull form started to evolve, with the top of the hull becoming flatter and the bow and stern becoming more ‘shiplike’, first with straight plumb bows, and later with different kinds of raked or angled bows. The submarines started growing larger, and the sails became higher and more pronounced. The large amounts of railings used on the early designs started to be replaced by removable railings mainly used when the vessels lay at anchor. Welding also started to be used more and more instead of traditional rivets, until eventually the submarines became of all-welded construction in the years leading up to WWII. These boats, optimised for performance on the surface, would reach their climax in the early 40’s. The classic German U-boats of the Type VII and Type IX classes belong to this group. During the war and in the immediate post-war period, advances in propulsion for submarines, and in search radars for the submarine’s adversaries, meant that the focus shifted from surface to sub-surface operations. As such, the hull forms started to shift yet again, with the decks becoming smaller (relative to the hull size), and everything started to become rounded to lower drag and avoid turbulences. All kinds of fixed railings disappeared. As a general rule of thumb, midget submarines (which started to appear during WWII) have followed roughly the same pattern as the conventional submarines, but are smaller. In other words, in the same way as a car-enthusiast finding the remains of a rusted car in a backyard would have no problem in telling whether it’s a fifties American muscle car or an eighties Japanese compact, no one with even a basic knowledge of submarines should have any problem with determining the wreck of a Holland-type submarine such as Som from that of a post-WWII midget submarine. Especially if the hull is “largely intact and not showing any signs of damage”. With regards to the lack of vegetation and sediments, several people, most notably Ola Oskarsson, noted that more or less all wrecks in the Baltic Sea that are found at depths deeper than 40 meters shows very little growth or sediments, and as such this is not an indication that the wreck is new. Who is Ola Oskarsson then? He’s the founder, member of the board, and Market Developer of MMT, a Swedish diving and sea survey company that has found numerous wrecks, including submarines of varying age and the Swedish Air Force DC-3 downed by Soviet fighters in the fifties (however, unlike Ocean X Team, MMT have never found an UFO…). Within hours of the discovery it was soon clear that the most likely candidate for the wreck was Som. It was one of relatively few submarine-classes ever built to measure around 20 meters in length (Som having an LOA of 19.3 m), with even WWI submarines often measuring 30 meters and above, and midget submarines usually (to the extent that one can generalise a midget submarine) being 10-15 meters in length. Several details also matched, and the Som was supposed to have sunk in Swedish waters west of the Åland Islands. As it was a Tsarist-submarine, the pre-1918 spelling, “Сомъ”, would also have included the hard sign ‘Ъ’, which was visible in the videos released from the wreck. The really interesting part was when it started to become clear that Ocean X Team had deliberately been searching for the Som for at least a year. Did Ocean X Team know that it was the Som you were looking for? Of added interest was the fact that the videos shown had the date stamp 15.07, i.e. the Ocean X Team had twelve days to shift through the material before presenting it to media. Note that while we do not know the full scope of the material available to Ocean X Team, it is most probably far longer than the short second clip shown publicly, and includes video of the nameplate. Ocean X Team’s response when faced with the allegations that they had knowingly concealed the age and identity of the submarine to get added publicity, was to state that they thought Som would be “much further south”, that they haven’t been able to compare the sail with any pictures to be certain of the ID of the class (the Som had an extensive rebuild in 1914, and there are apparently no detailed drawings of the final outcome), that the picture of the nameplate found by Peter Krantz had evaded them (a fact Lindberg admitted was “embarrassing”), and that they had received “very limited information” from iXplorer. And finally, they didn’t even care to mention the Som in the opening speculations, despite it fitting the description of the wreck on numerous points. Except for the point about iXplorer lying about whether or not they had forwarded the info that the coordinates given should lead to Som, I find all of the bullet points above highly questionable. I am no diver, but I find wreck hunting extremely interesting, and have a general picture of how this is usually conducted. Any diver looking for a wreck will tell you that the lion’s share of the work is the background research, spending hours and hours in archives and scanning old newspapers and official reports. This also seems to be the case here, with at least a year, probably more, of background work going into this project before the wreck was actually found. That they during this year would have missed such basic facts as the name Som being spelled with a hard sign, or the general shape of a Holland-class submarine, means that the Ocean X Team is either sloppy, incompetent, or lying. In light of their earlier successes, I find the first two rather unlikely. A far more likely explanation than ineptitude is that the whole thing is a PR-stunt made to bring publicity and hard cash to the team, something that is supported by the poor financial state of the company. The sums taken for publishing the material might also be of interest: 10 seconds of video goes for 35,000 SEK (~3 700 EUR), while still pictures go for 10,000 SEK (1 055 EUR) a piece according to DR.
Much has been made about the Russian connections, and how the borderline hysteria the initial reports created has been used by Russian state-controlled media to discredit the Swedish subhunt which last year was able to confirm foreign underwater activity deep inside Swedish waters. Still, to say that Ocean X Team is on Putin’s payroll is to jump to conclusions. It may well be that the idea of presenting the find as a potential modern-day intruder stemmed from Russia, and was proposed to Ocean X Team by iXplorer as a great way (or so it seemed at the time) to get more publicity out of an otherwise very niched find. If this is the case, one can safely assume that Ocean X Team believed iXplorer would support the story, and not throw them under the bus at first opportunity. It may also be that the idea came from Ocean X Team themselves, and that Russian state propaganda simply decided to take advantage of the opportunity. Wherever the idea originated, it was ruthlessly used by the Kremlin for their own purposes. I find it entirely possible that Mikhailov, having served as a diver in the Russian Northern Fleet, was sincere in wanting to find the submarine and the last resting place of his brothers in arms, and that either he or someone closer to one of Kremlin’s intelligence agencies somewhere along the way realised that the project could also provide an opportunity for a propaganda coup as well. This would be supported by the time scale: we know that Ocean X Team, and presumably iXplorer as well, has worked on finding Som at least for a year, probably longer. The need for a submarine-based propaganda story aimed at Sweden was far smaller/non-existent last July, not to mention two years ago in the pre-Crimean age of European security. At this point, the best Ocean X Team could do is probably to come clean, admit they tried to enlarge the public interest in the story by leaving out certain details, and apologies to the media, the public, and the experts they misled. Admitting to having been outsmarted by iXplorer might hurt, but trying to stick with a story that’s basically telling the world that they don’t know how/didn’t care to do proper research will probably hurt even more in the long run. Naturally, if there have been undeclared money transfers involved as some has hinted at, coming out might not be possible unless they are prepared to have a talk with the Swedish tax agency (bad case) or SÄPO (worse case). >Twitter selvitti #Som-sukellusveneen tiedot yhtä nopeasti kuin #Migrit in taustat. Molemmissa voi jäädä ihmettelemään viestinnän motiiveja.